An extremely popular promotional item. 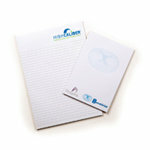 Our Note Pads are available in A5 format. Printed in 4 colour process. The sheets are glued at the head. This range has proved a highly successful and long life promotional product. 25 leaves per pad (with strawboard backing)For example, a set of labels, each with the same basic layout, can be printed with a different name on each label.